Start Your Free 7-Day Unlimited Trial Now! Bridge24 is a complementary power application currently available for Asana, Basecamp, Trello and AceProject. It dynamically connects to your account and provides incredible features to visualize, filter, edit, export and more. 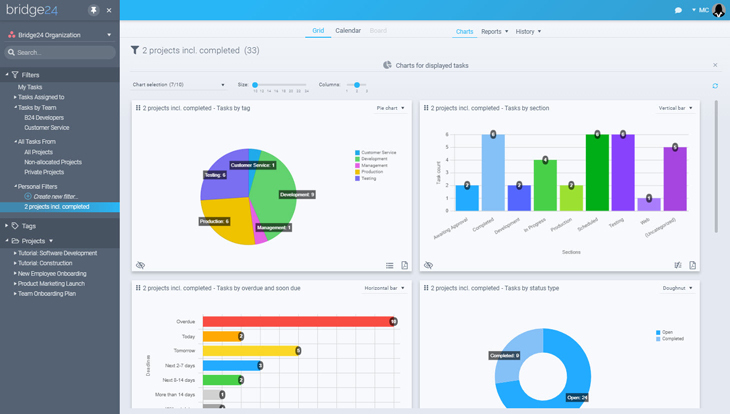 Bridge24 is built for project planners and managers, normal day-to-day users and those requiring reporting capabilities for their light project management application. Bridge24 is filling the feature gap. Unlimited features during the Free trial? Yes, when signing up for Bridge24 you are provided a Free Unlimited account for the trial period. Use all features as many times as you like! How does Bridge24 connect to my Data? We use the official APIs (Application Programming Interfaces) created by the providers to connect to your account and retrieve/display/update your data. Access rights are maintained with your connection.